For the parents who have obviously forgotten that most children are borderline sociopaths when it comes to teasing one another, this jumper will pretty much guarantee your kid will be bully fodder until he graduates from high school. 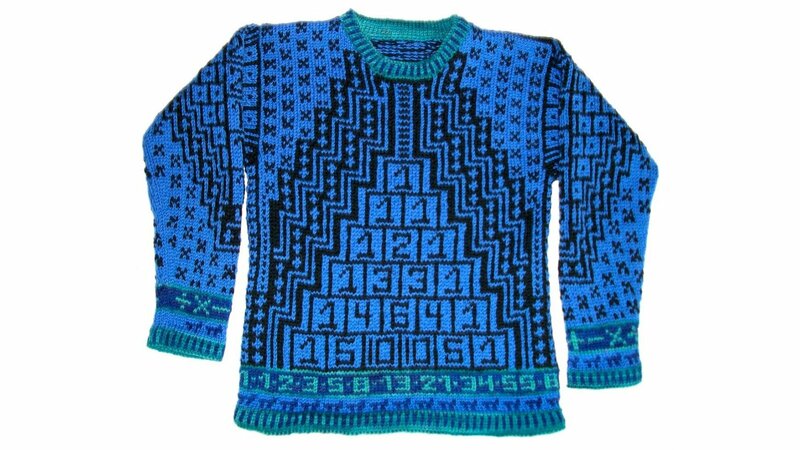 The main body of the sweater is a pattern of adding numbers in block shapes. There are also little x's in black. Circling the bottom in green on a dark blue background are Fibonacci numbers. Also circling the bottom and wrists in dark blue on periwinkle is the symbol pi. The back and front are identical. The sleeves have descending and ascending blocks with the prime numbers. Circling the wrists in green on a dark blue background are the various mathematical functions of add, subtract, multiply, and divide. The neck, wrist, and bottom trim is varying shades of green with blue stripes.